The word dementia describes a set of symptoms that may include memory loss and difficulties with thinking, problem-solving or language. It is not a disease in its own right and it is not a natural part of ageing. Dementia is caused when the brain is damaged by diseases, such as Alzheimer’s disease or a series of strokes. Dementia is progressive, which means the symptoms will gradually get worse. Find out more about dementia by visiting the Alzheimer’s Society website or watching their short video ‘What is Dementia?’. Dementia affects over 750,000 people in the UK and there are 45,000 people living with dementia in Wales. What does the Assembly becoming a dementia-friendly organisation mean? A dementia-friendly Assembly is committed to helping to raise awareness and understanding of dementia amongst Assembly Members, and the wider Assembly community. “By extending its equality of access to people living with dementia, the National Assembly for Wales will be demonstrating that people with dementia are both welcome and able to participate in civic life,” said Sandy Mewies AM, the Assembly Commissioner with responsibility for equalities issues. Champion the rights of the 45,000 people living with dementia in Wales, and those who care for them. Ensure Alzheimer’s Society’s Dementia Friends information sessions are delivered to public facing staff so they are equipped to respond to external visitors living with dementia. Ensure staff who have caring responsibilities for people living with dementia are directed to support available through the Alzheimer’s Society. 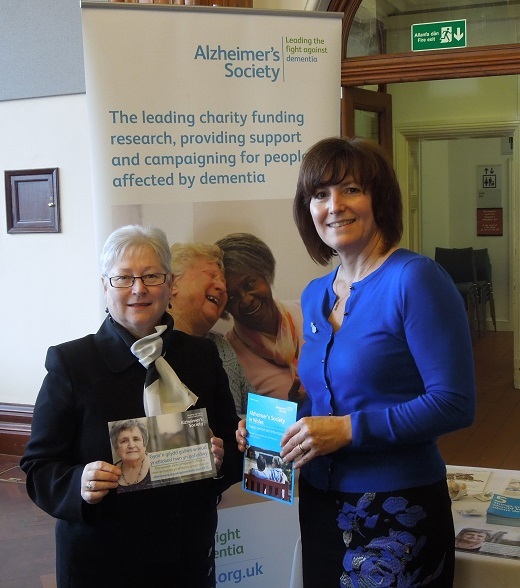 Provide Dementia Friends information sessions for Assembly Members, their staff, Assembly Commission staff, and contractors working on the estate so that they are equipped to assist constituents and people they come into contact with who are living with dementia. In fact, to date almost half of Assembly Members have already become Dementia Friends.